Who is interested in keeping the Sunanda case under wraps and forcing a slowdown on the investigation of the Delhi Police? Taking his fight to a logical conclusion, BJP leader Subramanian Swamy on Friday filed a petition at the Sessions Court seeking the production of Delhi Police Vigilance Report on the frauds and sabotages in the mysterious death of Sunanda Pushkar by the first probe team. Filing petition under CrPc 301, Swamy also pointed out that Delhi Police chargesheet against husband and Congress MP Shashi Tharoor is now just limited to abetment to suicide and domestic violence only and Police has not yet probed on the 12 injury marks on Sunanda’s body and Tharoor’s attempts to sabotage the case by sending emails of wife’s fake diseases to Doctors conducting post-mortem. A Vigilance Probe was ordered by the former Delhi Police Commissioner Alok Verma. The Vigilance probe found that the first probe team took eight months to handover the bed sheet, where Sunanda’s body was found to post-mortem doctors. Criminal Procedure Code (CrPC) 301, empowers a citizen to assist the court during the trial in bringing the aspects of the case. Shashi Tharoor’s advocate Vikas Pahwa objected to Swamy’s petition saying that Swamy’s in an outsider in the entire case. Swamy countered his arguments saying that CrPC 301 enables any dutiful citizen to bring facts before the court and reminded that Delhi Police was forced to file a chargesheet only after his petition to the Supreme Court. Judge Arun Bharadwaj rejected Tharoor’s advocate’s arguments and said that Swamy has every right to file petition, directing him (Pahwa) to file a reply to Swamy’s petition on the next date of hearing, April 26. The Judge also rejected Tharoor’s advocate’s demand for keeping the contents of the chargesheet secret. The Judge pointed out that the trial is happening in open court and no such regulations can be implemented. Earlier settling the chargesheet and transferring the case to Sessions Court, Additional Chief Metropolitan Magistrate Samar Vishal ordered Delhi Police to keep in safe custody its Vigilance Report on frauds and sabotages committed by the first probe team headed by Joint Director Vivek Gogia and the then Special Commissioner Dharmendra Kumar in 2014. A Vigilance Probe was ordered by the former Delhi Police Commissioner Alok Verma. The Vigilance probe found that the first probe team took eight months to handover the bed sheet, where Sunanda’s body was found to post-mortem doctors. The All India Institute of Medical Sciences (AIIMS) doctors led by Sudhir Gupta had categorically said that there are 12 injury marks on Sunanda’s body found from Hotel Leela on January 17, 2014, when Tharoor was a Union Minister. AIIMS Doctor Sudhir Gupta has come out publicly that the then Health Minister Ghulam Nabi Azad had demanded him to term the death as natural. The AIIMS report also mentioned that many times Shashi Tharoor emailed to Doctors saying that his wife was facing serious diseases and fake medical certificates were also attached in the email. Some emails were routed thru Tharoor’s then Officer on Special Duty (OSD) Abhinav Kumar IPS. Swamy in his petition pointed out that this is a clear case of charging intervening in the probe and culprits including Tharoor should be booked under IPC 201 for suppression, manipulation of evidence. The Vigilance probe also found that CCTV visuals of the Hotel Leela were manipulated and even the mobile phones of Sunanda were handed over to Tharoor, a day after the mysterious death. 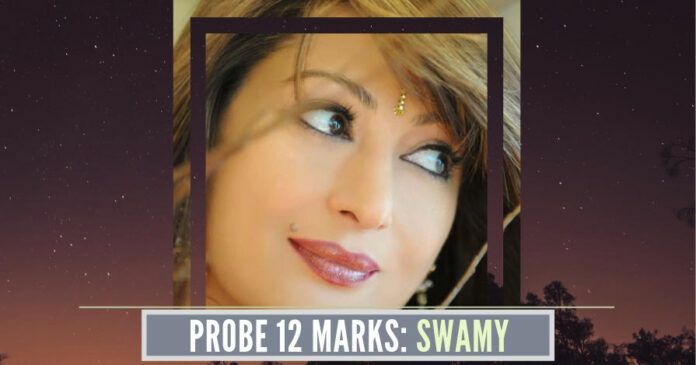 Swamy in his petition pointed out that Delhi Police assured the Court that they would finish the probe on the 12 injury marks on Sunanda’s body and file a supplementary chargesheet. But for the past 9 months, Delhi Police is keeping silent, said Swamy seeking to add charges against Tharoor and finding other people’s role in the mysterious death of Sunanda. Next articleCongress Poll Promises – Gone with the wind? Dr Swamy helps all who are alive but helping dead for her justice is great service to mankind . Admire the grit and perseverance of this strong man called Dr Subramanian Swamy. May God bless him for a long and healthy life for his bold portrayal of what ails India. He has the will and courage to expose wrong doers. Thank you sir for your diligence and actions. Dr.Swamy is the greatest Indian ever.He has literally saved India from disaster so many times.infact even preventing Sonia Gandhi from becoming the PM and later putting her on bail. the police do not screw up investigation for nothing. they are up to their heads drowning in corruption- so they screw it up to manage the outcome. the politician has had several wives- the crime is- he is not in jail custody while case investigated- the courts have given perpetrator the benefit of the doubt; could there be nexus- politician-police-legal officers of court? She comes across as a person who would not take her own life. Swamy has the capacity to unravel the case- finally. So many things happened in this case of Sunanda Pushkar, which happened few kilometers from Supreme Court, both the govt then (Khangress) & Supreme Court were blind, deaf & dump onthis case. It is beyond doubt that she was murdered and beyond doubt that entire 5* hotel was threatened means, it was officially coordinated murder. Helpless poor lady she had no idea with whom she got married & it took her life. She was married to a play ploy, funded by Pakistan for IPL & other agencies like Daewood Ibrahim, encouraged, managed by then ruling govt i.e. Khangress govt. Its impact on India is very serious for the killers are there in India or brought from Russia, lodged in the same hotel & vanished.